The popular Street Guard has been combined with the new Hatch X11® liner to set the new standard in cut-resistant duty gloves. 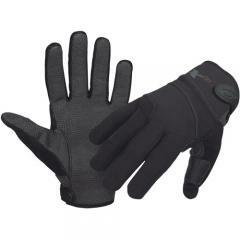 The SGX11 is tested from 7-11 lbf of cut resistance and protects your entire hand against injury from sharp objects. All Hatch Street Guard gloves feature digitized synthetic leather palms with Posi-Grip® non-slip cradles to offer sure grip and positive weapon control. The 1.5mm neoprene and nylon spandex laminated backs allow air circulation to keep you cool and provide a snug fit without hindering dexterity. The outer thumb areas have terry cloth for wiping away perspiration. Hook and loop closures keep the Hatch SGX11 gloves firmly in place. Use them for jail searches and they provide excellent protection, with enough tactile feel to find and manipulate contraband. Does the job for bag searches at check point.